ScanWritr is an online editor and converter. It is perfect for business, educational and home use. ScanWritr turns your computer into an all-in-one converter and document editor. So, it is suitable for editing of various documents like contracts, articles, business cards, notes, receipts, warranty papers, etc. Work can be done from any PC, Mac, smartphone or tablet with internet access. Furthermore, you don’t have to install any app. Simply visit ScanWritr web! ScanWritr – powerful online editor and converter. You can use any device connected to the internet to edit documents. Just go to the ScanWritr web, and upload the document that you want to edit. Then fill it, sign it, preview it, and export it. That’s it! 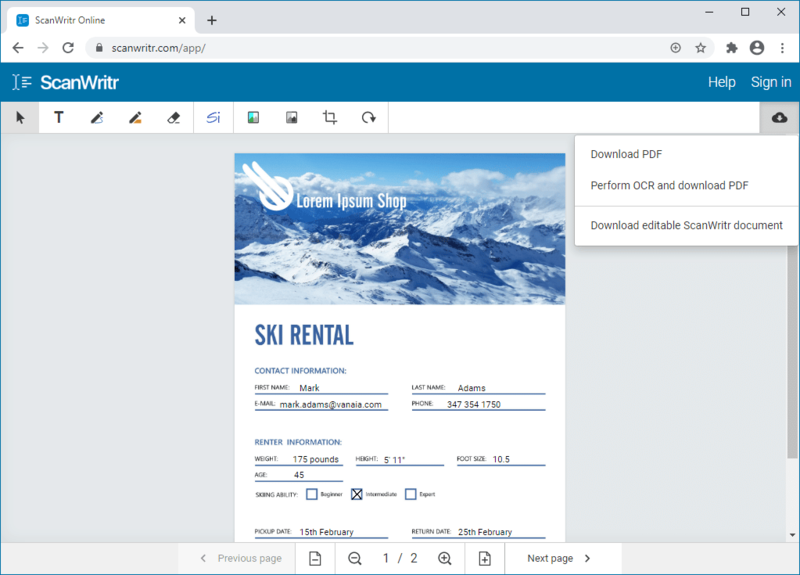 ScanWritr supports all most common document formats. ScanWritr supports PDF, Microsoft Office, Apple Pages, Apple Numbers, Apple Keynote, LibreOffice, OpenOffice, Hancom Hangul, ScanWritr documents, and JPEG, GIF, PNG, BMP images and scans. So, you don’t have to convert documents manually. Therefore, you can easily edit a document that you captured with your smartphone, or scanned with your scanner. ScanWritr will automatically convert and optimize it for editing. All you need to perfectly prepare your document. 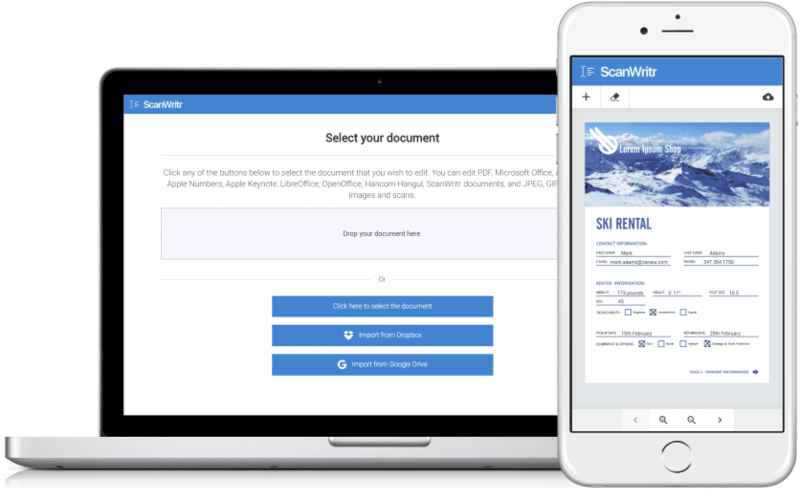 ScanWritr enables you to edit your documents easily. 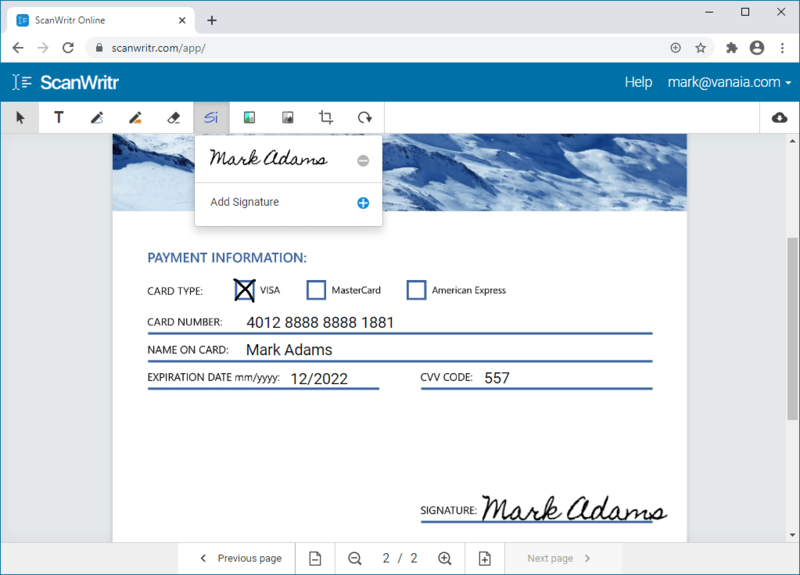 You can add signature and annotation. You can use eraser or pen. Or, you can fill out the blanks using the writing tool. Then export your document as a PDF. So, this makes your documents ready for sending, sharing, printing or faxing. But beside this, you can also improve document quality and retouch it. You can do it by using our image enhancement features. It will make the digital copy of your document as high quality as possible. You need no installation to convert and edit a document. If you need to open a document and edit it, there is no quicker or better option than using the ScanWritr. Just visit the ScanWritr page. Then, upload document, edit it by inserting texts, annotations, and signatures. Finally, save it as a PDF and make it ready for sending, sharing or faxing.